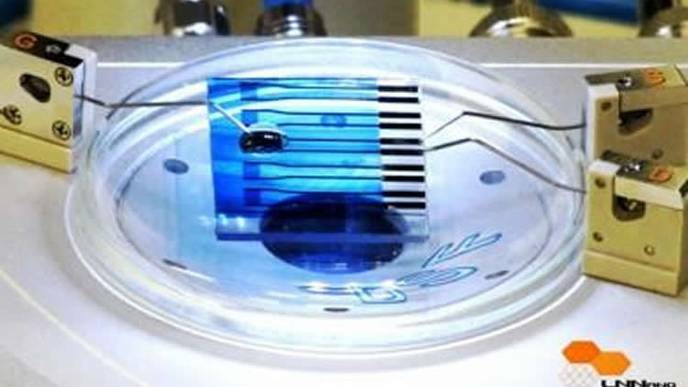 A biosensor developed by researchers at the National Nanotechnology Laboratory (LNNano) in Campinas, São Paulo State, Brazil, has been proven capable of detecting molecules associated with neurodegenerative diseases and some types of cancer. “This is the first time organic transistor technology has been used in detecting the pair GSH-GST, which is important in diagnosing degenerative diseases, for example,” he explained. “The device can detect such molecules even when they’re present at very low levels in the examined material, thanks to its nanometric sensitivity.” A nanometer (nm) is one billionth of a meter (10-9 meter), or one millionth of a millimeter. The technique is based on in situ synthesis of conductive polymers. For the polymers not to remain trapped on the surface of the paper, they have to be synthesized inside and between the pores of the cellulose fibers. This is done by gas-phase chemical polymerization: a liquid oxidant is infiltrated into the paper, which is then exposed to monomers in the gas phase. A monomer is a molecule of low molecular weight capable of reacting with identical or different molecules of low molecular weight to form a polymer. The monomers evaporate under the paper and penetrate the pores of the fibers at the submicrometer scale. Inside the pores, they blend with the oxidant and begin the polymerization process right there, impregnating the entire material. The polymerized paper acquires the conductive properties of the polymers. This conductivity can be adjusted by manipulating the element embedded in the cellulose fibers, depending on the application for which the paper is designed. Thus, the device can be electrically conductive, allowing current to flow without significant losses, or semiconductive, interacting with specific molecules and functioning as a physical, chemical or electrochemical sensor.